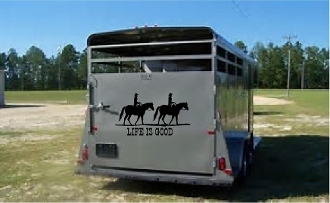 Trailer or truck decal measures 20"x11.5" or 32"x18" . If you want a custom size or decal just send us a message. Decals are made from glossy 651 oracal vinyl. They go onto the body of the vehicle or the glass and if you ever want to remove them you heat them up with a blow dryer and they peel off without damaging the surface. But they won't come off from the weather or washing them.